Need to know the temperature? Want to know if it’s high tide or low tide, a full moon or a half moon? Keep in touch with Mother Nature while still having a sense of style. With its analog digital combination, world time, stopwatch, daily alarm and countdown timer, this watch is truly one you can take with you everywhere. 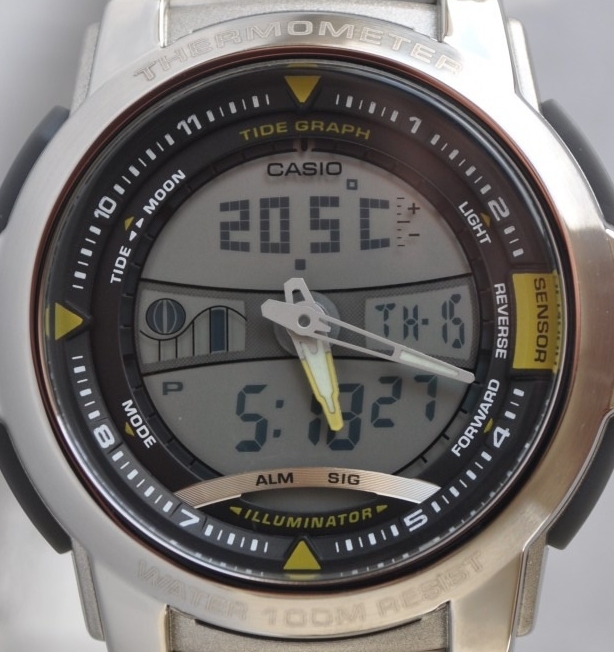 Silver Casual Sports Watch with Analog/Digital Dial and stunning full face illumination. A very stylish watch with a 1/100 Second - 100 Hour Stopwatch and fitted with a classic Stainless Steel bracelet, and presented in genuine presentation case with full instructions included. For fans of precision: the countdown timers help you to remember specific or recurring events by giving off an audible signal at a preset time. They then count back automatically from the preset time. The time can be set to the nearest second and up to 100 hours in advance. Ideal for people who need to take medicines every day or those who do interval training. One battery will supply your watch with the power it needs for about 2 years.